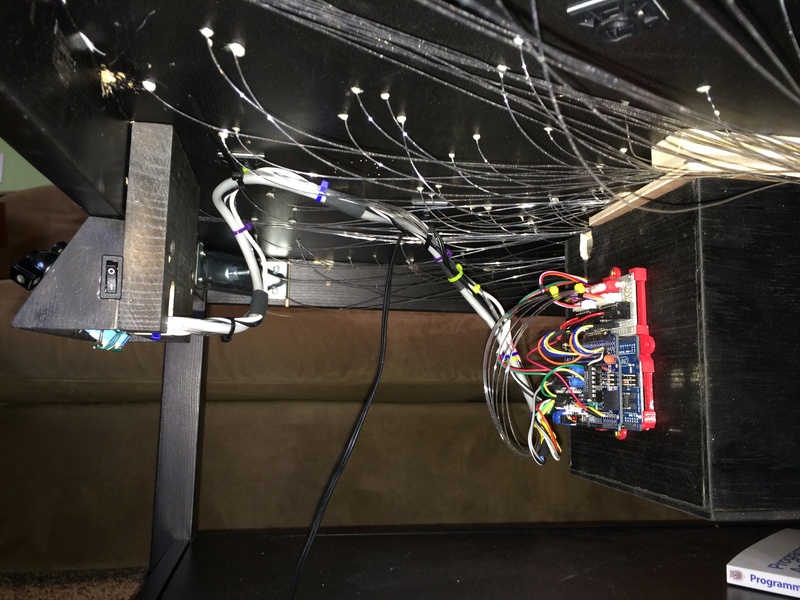 In order to fix this insidious (and totally contrived) problem, I decided to make mine significantly more interesting by adding about 400 feet of fiber optic filament, some stepper motors, and an Arduino controller. The first step was to drill all the holes (over 350 of them). 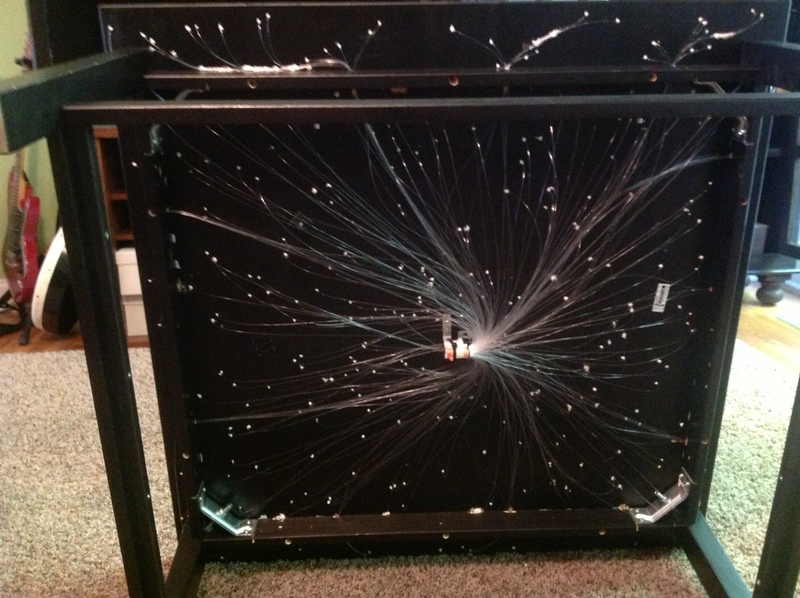 It seems somewhat easy to put random holes in a table, however, it turned out to be surprisingly difficult. My brain favors order and consistency far too much and I found that I was filling open spaces and attempting to distribute all of the holes evenly. 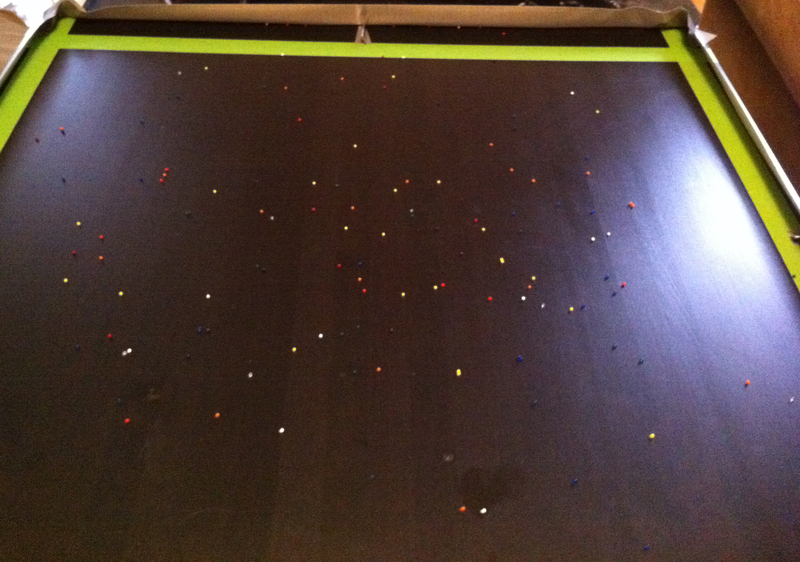 I wanted the pattern to be truly random so I threw hundreds of BBs on the table and marked where each one was before drilling. It was a lot of work and made a huge mess, but it did make a good pattern. These actually were un-hydrated “Orbs“, but I suppose that is irrelevant. 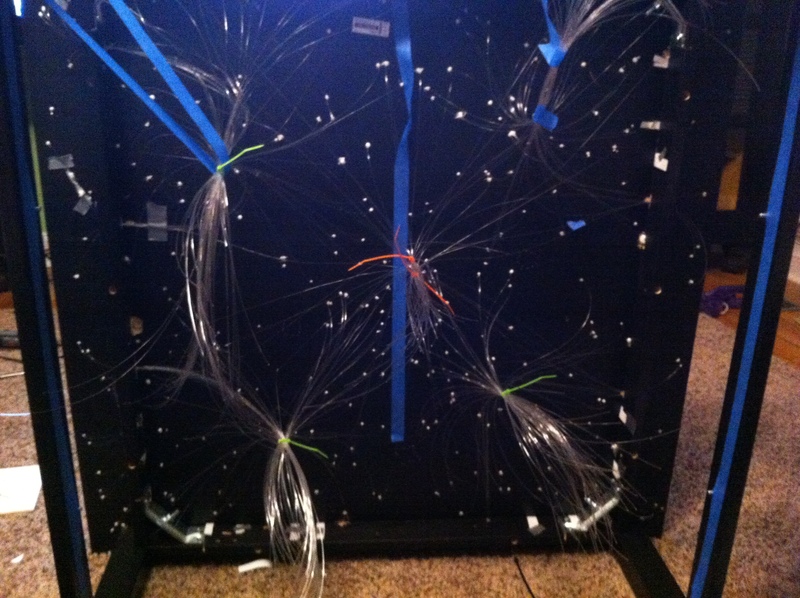 The filaments from each quadrant (green zip-ties) were joined and added to the main bundle (orange zip-ties). 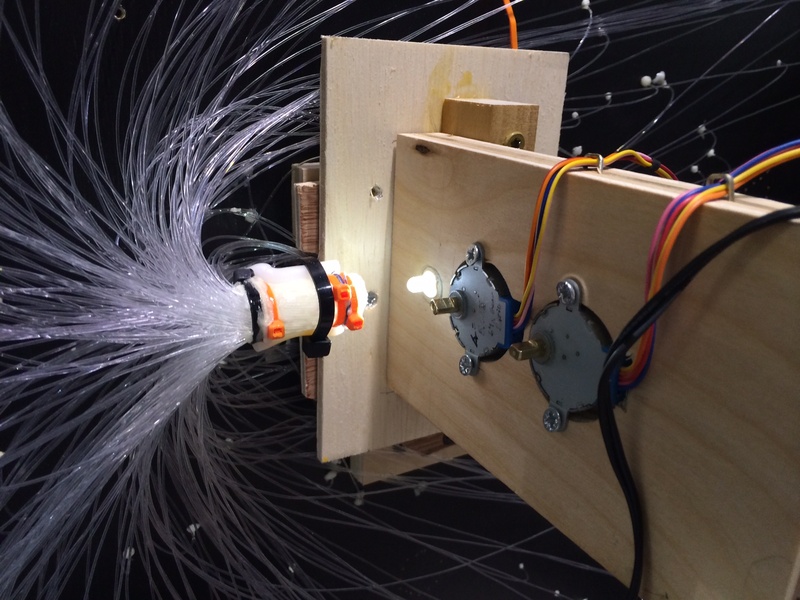 Using a laser to light up the filaments. Next two motors were installed: one controlled a color wheel and the other controlled an interference pattern to create a twinkling effect. 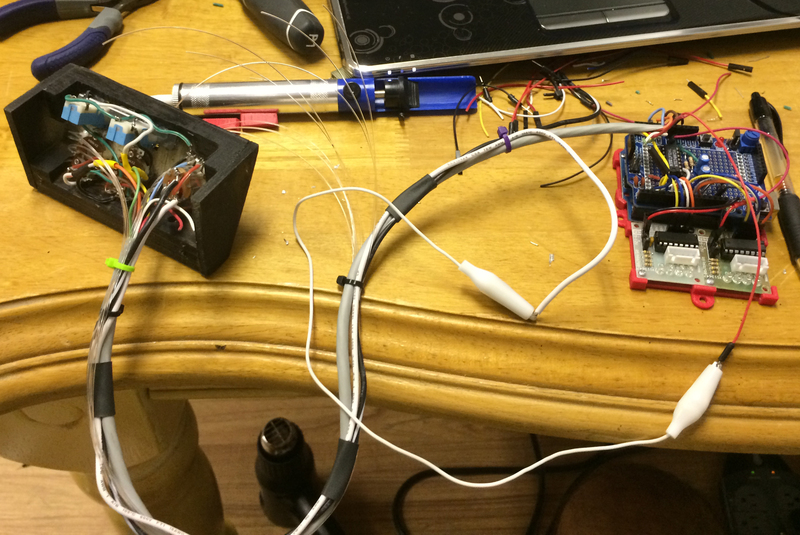 The motors come with the ULN2003 driver boards which were controlled with an Arduino Uno. The motors will spin 2 acrylic disks in front of the LED for color and interference. I used SketchUp to design a mounting bracket for the circuit boards. This made it easy to mount all 3 of them anywhere without putting strain the wiring or fibers. 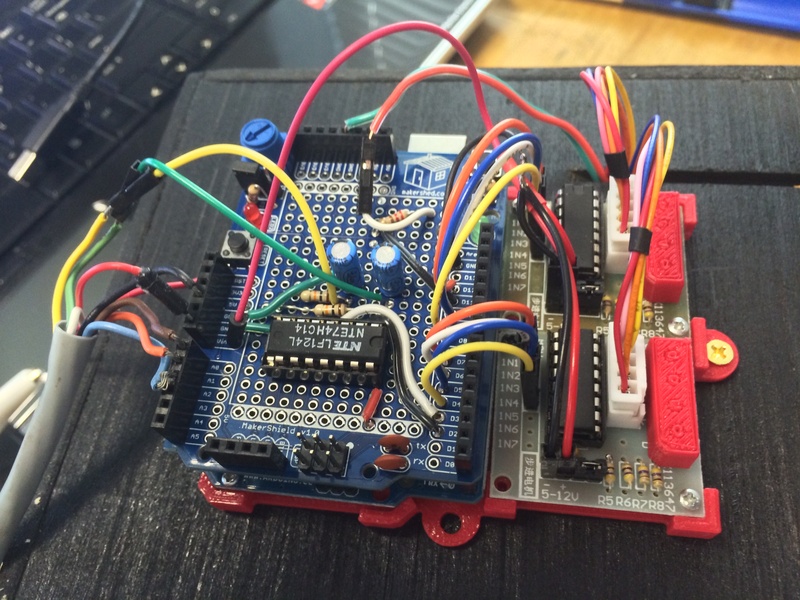 A prototype board is sitting on top of the Arduino. The red blocks off to the right are used to hold fiber optic lines directly over the existing LEDs on the motor driver boards. I wanted to control the speed and direction of the motors so I could see what patterns and colors looked the best (for future projects) so I built a control panel that extends from the bottom of the table. In order to stop the motors, a pause button was added for each that calls an interrupt on the Arduino. 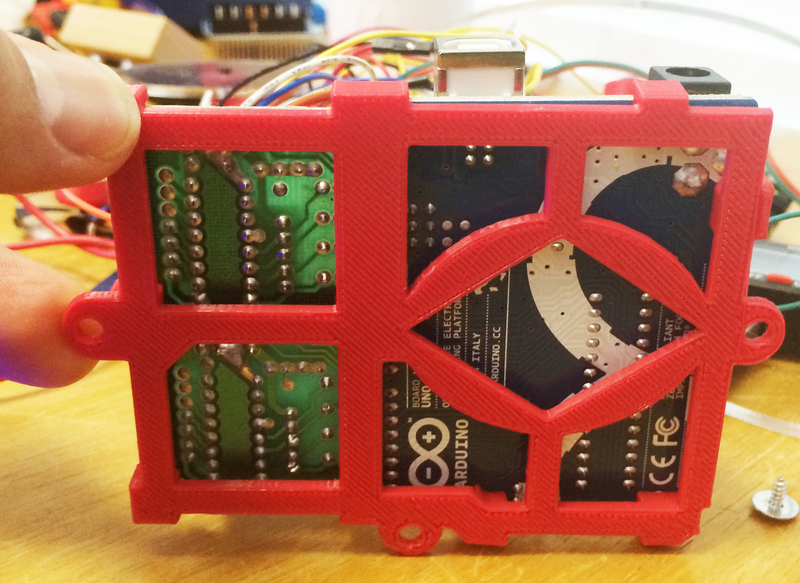 The motor driver boards each have 4 red lights on them to indicate the speed and direction of the motor. They are useful to tell what is going on under there, but I didn’t want them blinking away and lighting up the underside of the table. Instead of removing them, I covered them up (with a printed housing) and ran fiber optic filament back to the control panel so they were still visible but only as tiny dots. The little white dots are the fibers going back to the motor control LEDs. Control Panel and Circuit Board. I think it significantly reduced the feeling of “blah” that the table seemed to convey before the upgrade. As an added bonus, I can set the color to “grass”, “lava”, or “water” when my daughter is playing on it with her action figures!